A little bit of history; back in the 80’s, heavy metal band SAD IRON was formed 1979 in Hoorn, the Netherlands, by guitarist Bernard Rive. The band’s initial line-up was rounded out by Dirk Ooms (bass), Gerrit Soering (drums) and Jan Palenstijn (vocals). The band recorded their first album, “Total Damnation”, in studio, after they won a Battle of the Bands in their hometown, with the new line-up with Herke Van Der Poel as vocalist and Charles Heijnen. Nowadays, this is the first official reissue of this Dutch Heavy Metal classic album from 1983, including 2 live cuts and 3 bonus tracks (issued from the unreleased album “The Antichrist”). 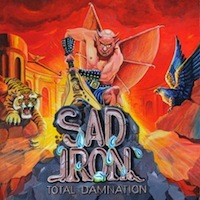 The “Total Damnation” reissue, coming out on Skol Records, feels like an early demo, as a result of the production being really poor, the sound is creepy as hell, which was recorded in one day; but don’t forget, we are in 1983 and SAD IRON was a really young band, beginning their career with all “clichés” from that time in their music. The lyrics were too simple, talking about the devil (that no longer scare anyone today) wrote by young Dutch metallers. The bright side of SAD IRON is that they remind me bands of EXCITER with some SAXON influences, with a punkish attitude, they’re playing speed metal with crunchy riff guitars, fast heavy metal parts, and catchy choruses, but the poor lyrical songwriting and their low technical instruments, (especially the solos aren’t the best I’ve heard in my life) to enhance their songs. To be honest, I found myself headbanging too at the end with this “Total Damnation” reissue, which is not so bad, but I think it’s intended only for old fashioned metallers who wish to listen to this old style.